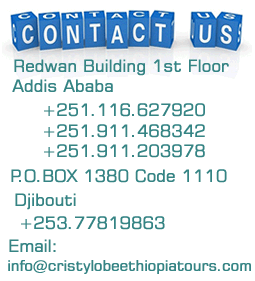 Arrive Addis Ababa Bole international airport meet our staff at exit gate and assist to transfer to hotel. Overnight at hotel of your choice. AM We exploring Addis Ababa beginning with a visit to the National Museum, one of the most important sub- Saharan museums in all of Africa. The museum is home to the fossilized humanoid Lucy, as well as an amazing collection of artifacts, royal items and art. We then visit the Ethnological Museum, which was the former palace of Haile Selassie. PM we take time in St. George Cathedral, built in 1896 by Emperor Menelik and then continue on to Holy Trinity Cathedral. Holy Trinity Cathedral is the largest Orthodox Church in Ethiopia and has survived through many historical periods, as its interesting architecture can attest to. The Cathedral contains the thrones and the tombs of the emperor and some of the royal family. Visit Merkato, the largest open air market in Africa. Overnight at hotel of your choice. This morning we take a 55 minute flight to north, to Bahir Dar. Bahir Dar is a pleasant city located on the shores of Lake Tana which is the meaning of the name city itself, the largest lake in Ethiopia. After checking into our hotel, AM we driving to the Blue Nile Falls, which is known locally as Tisisat (smoking water) falls: 400 m wide, the water plunges for 45 m, giving rise to steam clouds and rainbows. We climb down to the base of the falls for an up-close look and then ascend to the other side. This round trip will take about 1hour walking. Then we cross the Blue Nile by boat to return to the point of departure. 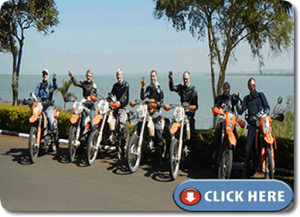 PM we explore the city of Bahir Dar, including the market and the Bezawit Palace (formerly the Palace of Haile Selassie). A short drive from our hotel, we visit a Weyto Village, where we will see the production of the papyrus boats known as Tankwas.Overnight: Tana Hotel or Summer Land Hotel, Bahir Dar. PM our visiting the city will begin from Fasiladas Gibi, there are a dozen castles built by various emperors over the course of 236 years. The city seems more European than African and also has Islamic influences. We will visit Fasiladas’ Palace which is probably the most impressive of all the castles found in the area and the oldest one, too! We continue on to the bath of Fasiladas. Then we continue to visit the Church Of Debre Berhan Selassie (Light of the Trinity). The interior of this is decorated with beautiful frescos, cherubs and paintings. 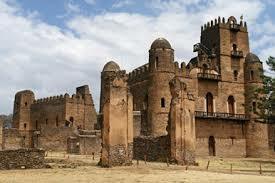 Debre Berhan Selassie is rumored to once have been the proposed final resting place of the Ark of the Covenant. Later on, we will visit the colorful market of Gondar. Overnight at Goha/ Taye Balay/Qwara hotel at Gondar. Today we drive to the jagged panorama of the Simien Mountains National Park, famed for its exclusive landscape, afro-alpine vegetation and unique wildlife, where you may spot the endemic Wallia Ibex, Gelada Baboon troops, Bushbuck, Klipspringer. However, as we stay for one night we will enjoy the dramatic scenery and a troop friendly Gelada Baboon at very close distance and Birds such as Chestnut-napped Francolin, Mountain Thrush, Thick-billed Raven, Lammergeyer, White-collared Pigeon and Ankober Serin just to name a few. Arrive to the lodge check in, have lunch, after short rest, for those who interest in hike/Trek we will trek for about 2-3 hrs on the edge and beautiful escarpment to view the beautiful and green valley, wondering the long day eating and grooming of Gelada Baboon families and then trace back to the Lodge. Overnight Semien Lodge. Spend the whole morning in an amazing the Simien Mountains National Park: the incredible mountain scenery is breathtaking. Hike along mountain trails enjoying the endless unique flora and fauna of this elevated region ( Giant Lobelia). 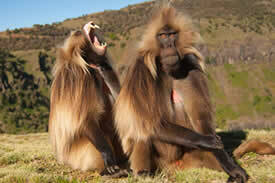 Drive to Chenek and trek see Wallia a unique species indigenous to Ethiopia and the Simien Mountains. Return to Gondar for overnight Goha/ Taye Balay/Qwara hotel at Gondar. A flight further north takes you to the oldest city in Ethiopia, Axum. Eight Km drive to the Town check in hotel. This afternoon explore the city. Visit the interesting museum in stelae field, the impressive Stelae Fields and also the grounds of the 16th-century Cathedral of St. Mary of Zion, home of the original Ark of the Covenant, Queen of Sheba ruin palace and Tomb of Kaleb and Gebre Meskel at certain place will be dropped for souvenir and stretching your legs to the hotel. Remhai Hotel / Yeha Hotel. 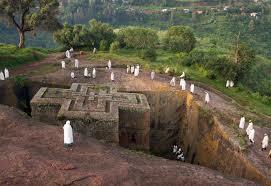 Fly to the UNESCO World Heritage Site of Lalibela – the Jerusalem of Ethiopia, and Africafs own ePetraf. In a fitting finale to your Ethiopian adventure, explore the first group of the monolithic red-Tuff churches incredibly carved into the rock. Your will lead you through the network of crevices and tunnels linking each of the churches. The churches are still in use today: finally walk to the separately standing, uncovered and beautiful Saint Georges Church down to narrow path to church, step inside and you will see a robed priest going about his timeless business. Late afternoon drive back to your hotel. Overnight Mountain View/Roha/Tikul Hotel. This morning we will have excursion to Nafakto Lafab cave but built church up into the side of a hill which is considered as the third type differ from Monolithic and Semi Monolithic churches in the town. Drive back to your hotel and lunch. PM we take drive to the eastern (second) group of rock churches: smaller in size, these are no less impressive, with intricate carvings and many dark tunnels to explore. 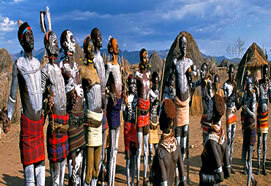 Late afternoon we will take you to an Ethiopian coffee ceremony in private home. Mountain View /Roha/Tikul Hotel. Fly back to Addis Ababa afternoon at leisure and then transfer to airport fly back home.